Jimmy Morales has no political experience but was elected on a wave of anti-corruption sentiment in the central American country. 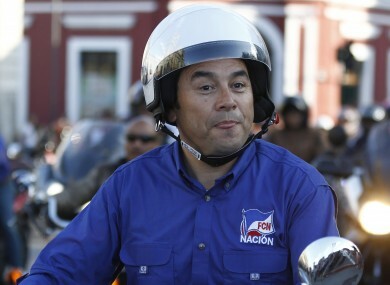 Morales rides his motorcycle prior to a campaign rally earlier this month. COMEDIAN JIMMY MORALES won a landslide victory in Guatemala’s presidential race yesterday despite having no political experience, after a campaign upended by a corruption scandal that felled the outgoing president. Morales, a comic actor and TV personality, declared victory as election officials released the resounding results: 68% of the vote for the conservative candidate to 32% for former first lady Sandra Torres, with 97% of polling stations reporting. “With this election you have made me president, I received a mandate and that mandate is to fight the corruption that has consumed us,” said Morales on national TV. Thank you for this vote of confidence. My commitment remains to God and the Guatemalan people, and I will work with all my heart and strength not to defraud you. It has been a remarkable ride for Morales, who started the race with just 0.5% support back in April. The campaign was rocked by president Otto Perez’s resignation and arrest on corruption charges on September 3, three days before the first-round vote. Prosecutors and United Nations investigators say the network collected $3.8 million in bribes between May 2014 and April 2015 — including $800,000 each to Perez and jailed ex-vice president Roxana Baldetti. He won the first-round vote with 24% to 20% for Torres, who was running for social democratic party UNE. Morales, 46, is famous for playing a country bumpkin cowboy who nearly becomes president in the 2007 film A President in a Sombrero. Email “Guatemala's new president is an actual comedian ”. Feedback on “Guatemala's new president is an actual comedian ”.